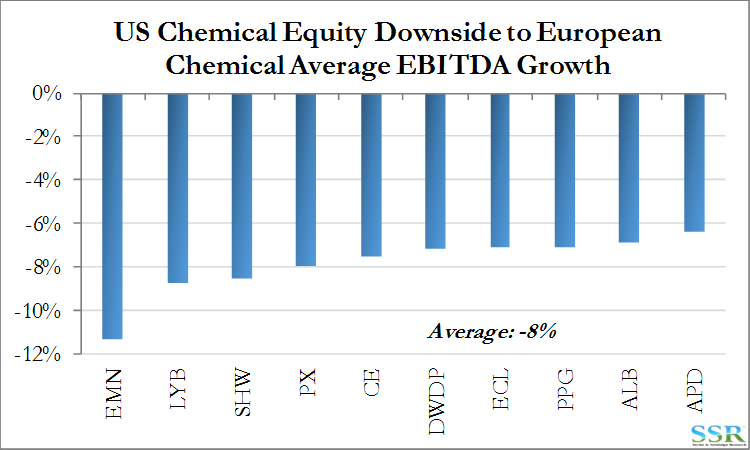 SSR LLC – Chemicals: European Arbitrage – Why Are Expectations So Low? 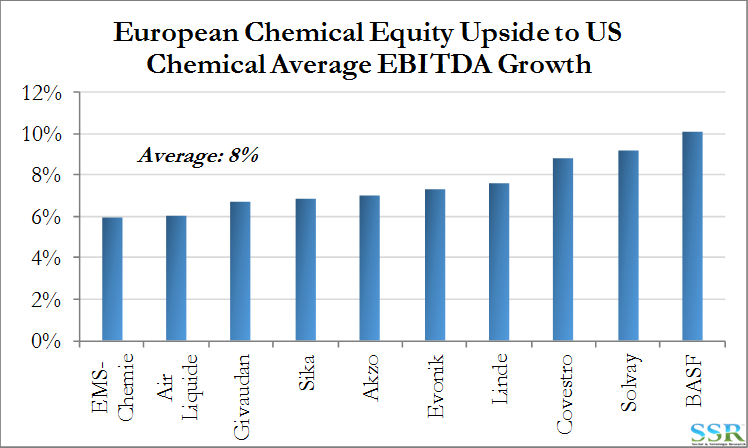 Expectations for earnings for the European Chemical Companies fall far short of those for their US counterparts – with the 10 largest US companies forecast to grow EBITDA by 12% in 2018, while the top European companies are forecast to grow only 3%. Sell-side recommendations for the European companies are lower than they are for the US companies but not by much and valuations are similar on an EV/forward EBITDA basis. 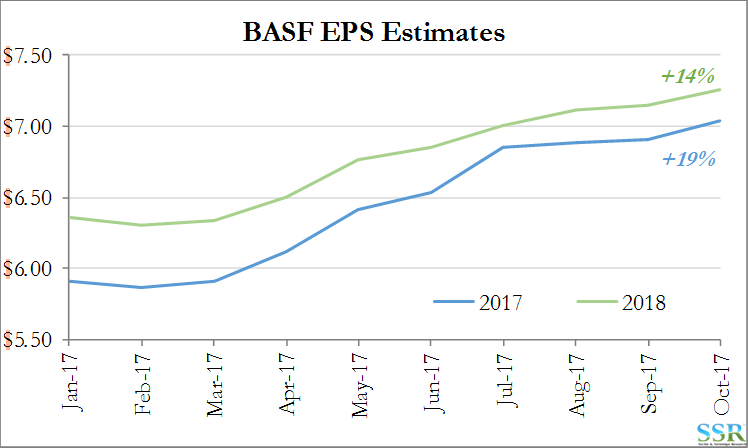 BASF and Covestro showed price and volume momentum in Q3, and currently expectations are for the Europeans to see greater EBITDA growth than the Americans in 2017 – Exhibit 1. Pricing and volume momentum should continue into 2018 in our view unless the inflection in economic growth that we are seeing today reverses quickly. As both BASF and Covestro have demonstrated, operating leverage is high. While there has been plenty of historic relative volatility between the two groups in the past, expectations for 2018 suggest that the Europeans are too pessimistic, and especially relative to the Americans – we can make a case that US estimates for 2018 are still too low. 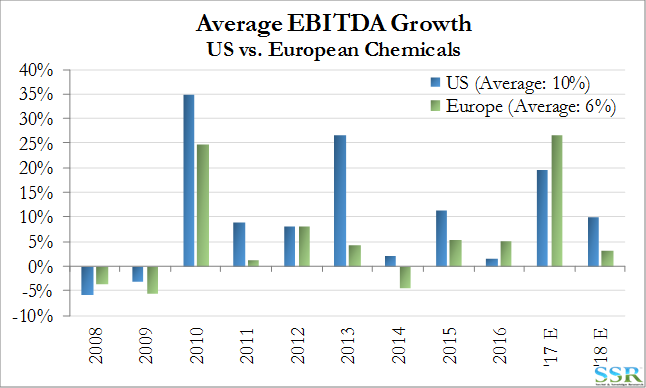 In Europe there is an inconsistency between EBITDA growth expectations and both analyst recommendations and stock valuations – you should not be recommending stocks with less than 5% expected EBITDA trading at a high EV/EBITDA multiple. In the US, the expected EBITDA growth, recommendations and valuation are more in line. If we assume that European growth expectations for 2018 are correct and a good proxy for the US, the US group is overvalued by an average of 8%. If we assume that the US estimates are the better proxy, the Europeans are undervalued by 8%. 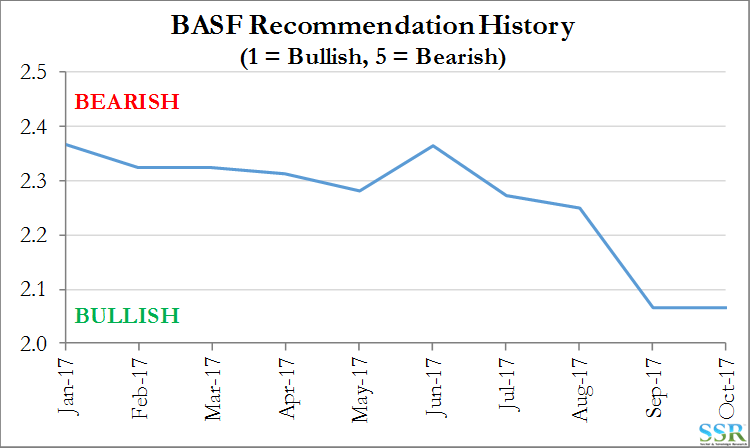 Just based on this analysis, the largest arbitrage is between BASF and EMN (buy BASF/short EMN); Covestro and Solvay also look interesting – against LYB and SHW. Given some of the strong Q3 numbers that we have seen so far from the Europeans, it may make sense to overweight the group for the balance of this year as estimates normalize. The European Sell Side has much more conservative growth estimates for its coverage group that their US counterparts for 2018. Estimates are rising as results come in – as are recommendations, but we expect the same in the US, and do not expect the expectation gap today to close quickly – Exhibits 2 and 3. The European stocks are a little cheaper, though probably not relative to local indices, and the European analysts are slightly more bearish in aggregate – but not bearish enough if they believe in the growth rates implied in estimates. As shown in Exhibit 1, there is no historic alignment of note, but the expectations for Europe already feel wrong relative to the US, and we think US expectations are too low if we continue to see stronger global economic growth. In this case we are talking about aggregate numbers – we are still very cautions on the coatings space and much more bullish on commodities, intermediates and specialties. In the analysis below (Exhibits 4 and 5) we extrapolate both cases – identifying upside in the European names assuming the US growth estimates are a proxy for Europe – and identifying the downside in the US names if the European estimates are right. This is a first order approach – we have held multiples and recommendations constant and just varied EBITDA. In reality – better European results would probably be accompanied with higher recommendations and higher multiples – suggesting that the upside could be greater than shown. The reverse would be the case for the US names in a weaker growth environment. 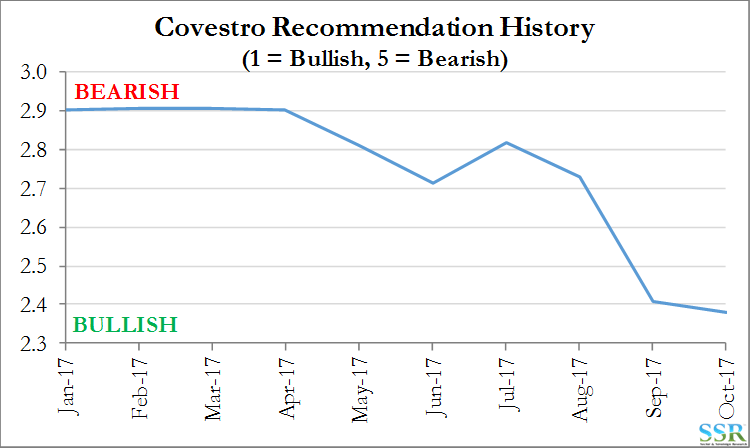 With Covestro’s better results we have already seen a step up in expectations for 2018 and increases in target prices and recommendation – Exhibits 6 and 7. We would expect this trend to continue – driving upside in the European names over the balance of the year. 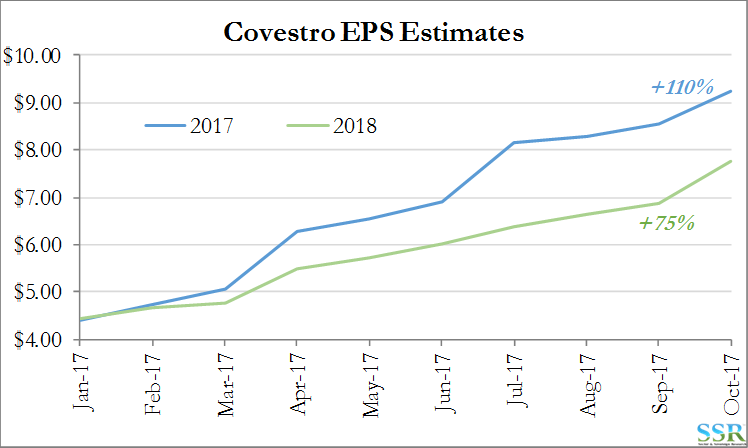 The absolute lower estimate for Covestro for 2018 today is driven by an expectation that peak pricing for TDI will fall in 2018, as the price increases this year have been driven by supply outages. We think there is a chance that strong polyurethane demand growth could keep strength in the supply chain through 2018 also. 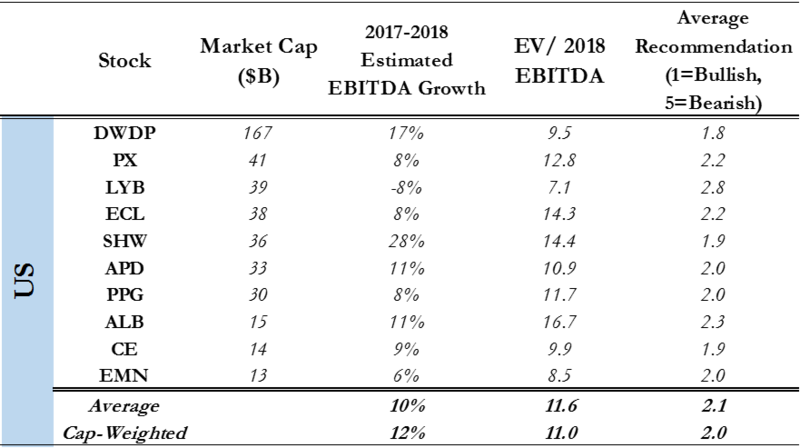 The same pattern is also developing for BASF – Exhibits 8 and 9.